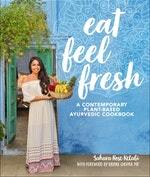 Advice on eating for your Dosha as the weather warms, from Eat Feel Fresh by Sahara Rose Ketabi. As an Ayurveda author and expert, my diet and lifestyle practices revolve around the Dosha of the season. Ayurveda is the world’s oldest health system originating in ancient India over 5000 years ago and the sister science of yoga, based on mind-body balance. The premise of Ayurveda is to eat according to your Dosha, mind-body constitution and that of the season. The word Dosha means energy and there are three types. In the warm months, I make sure my diet pacifies my Pitta, fire energy. When Pitta is out of balance, you experience oily skin, rashes, rosacea, hyperacidity, inflammation and food sensitivity. Mentally, you also experience excess “fire” in the mind – irritation, impatience and anger (hence the term “hot and bothered”.) This is why opt for cooling and hydrating foods to balance my Pitta in the summer. Here are the tips and recipes from my book Eat Feel Fresh, for Pitta season. Coconut oil is the most cooling oil, refreshing and hydrating your body during summer. In Ayurveda, whatever you put on your skin is consumed by your internal organs, therefore the type of oils we put on our skin is just as important of the foods we eat. Not only is coconut oil great for the skin, but it is also the best for cooking during Pitta season. I love sautéing swiss chard, broccoli and brussels sprouts in coconut oil with cooling herbs like basil, coriander and rosemary. Fennel is a cooling and hydrating herb that enhances digestion without warming up the body (unlike ginger.) It makes the perfect summer tea that is still warming for the digestive fire without overheating your system. These ingredients are rajasic, increasing Pitta (fire) in the system. In Eat Feel Fresh, I give options for each recipe to omit tomato, garlic and onion to make it Pitta-friendly, which is especially necessary for the summer. Bring your body into balance with over 100 healing recipes for a modern Ayurvedic lifestyle.